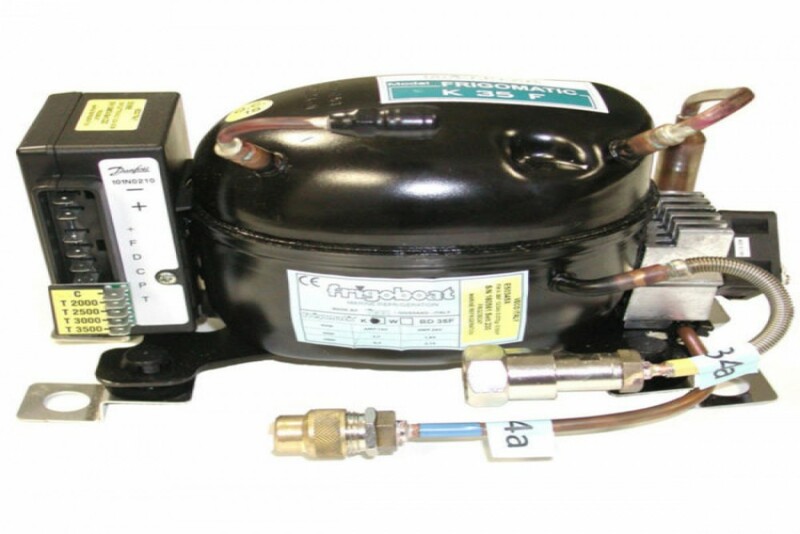 Download Technical Specifications Frigoboat K35F compressor is used with a Keel Cooler condenser (purchased separately) to provide your boat with super efficent refrigeration. Although water is being used for the heat transfer, it is staying outside your boat at all times. No pumps, no noise, no strainers to clean. Designed for refrigerator boxes up to 7 cu ft or freezer boxes up to 4 cu ft. Optional upgrade: Merlin automagic smart speed control board (E52152): replaces the manual speed board to give you automatic speed selection from the Danfoss/Secop BD35 compressor. Runs the compressor fast when the set point and acutal box temperature is significant; runs it slow when all you're doing is maintaining the box's set point temperature. There is also a fault indicator light for when the compressor should stop for a fault reason, will blink 1-5 times to let you know where to look for the problem.